I'm pretty sure you once had been in such a hurry in the end of a working day when someone gave you a file from USB stick or e-mailed it. You just did nothing but put it on your desktop. Okay, but how to take it back from the office computer? You can sync your desktop contents through iCloud Documents! ok, how to set it up? Many photographers use Apple iPad to show their portfolios or photo shoots to clients. The screen of iPad has a great specs including bright back-lit, high resolution, and color display that surpasses lots of laptop dislays. But even the iPad screen has its own peculiar properties which are subject to correct to get the best color display for your photos. Colors that could be rendered on the iPad screen (black triangle) in comparison to the AdobeRGB color space gamut; the photograph opened in Adobe Photoshop for color conversion. Assume that you have the right color profile of your iPad. Now you want to convert colors of your image to iPad display profile in Adobe Photoshop. To do that I advise you to rely on Relative Colorimetric intent with black point compensation. So you should select the menu item Edit > Convert to Profile... that will display the dialog window. Menu item for color conversion in Adobe Photoshop | Convert to Profile options. Relative colorimetric intent preserves colors from the source image intact if they can be displayed on the target device (mean iPad), and shifts the colors that are outside of the target device color space. Thanks to that all iPads have an IPS matrix of a high quality, iPad delivers a rich palette of colors. So the quality drop of the converted images should be small. In the opposite, application of perceptual intent leads to the proportional compression of the source color space to the target one. This could potentially result in surprisingly dimmed colors. Comparison of iPad and AdobeRGB color spaces gamut; Color transformation while converting image from AdobeRGB to iPad. Blue ovals mark colors that will be adjusted because they are beyond the iPad color displaying capabilities. For now you have converted an image to the iPad color profile. It's time to save the file to folder that serves as a source of images to sync. Then synchronize your iPad with iTunes, and it's done. It's possible to create a simple Action for Adobe Photoshop that will perform with your images all color conversion steps automatically in batch. There are only three color spaces available in Lightroom: sRGB, ProphotoRGB и AdobeRGB. So, if you would like to export images and convert them to iPad color profile simultaneously, you'll need the print module to select from different color profiles installed in your system and then save your photo(s). Photos placed above the text as illustrations are adapted for viewing on the original iPad (I cannot afford upgrading my tablet after each release :). So the photos here may look inaccurately on the iPad 2 or the New iPad, and will definitely look wrong on other devices. Below are pairs of images converted to the iPad color profile and their originals in sRGB. Color distribution of original images is plotted on graphs as well as AdobeRGB (rainbow triangle) and iPad (black triangle) color gamuts. 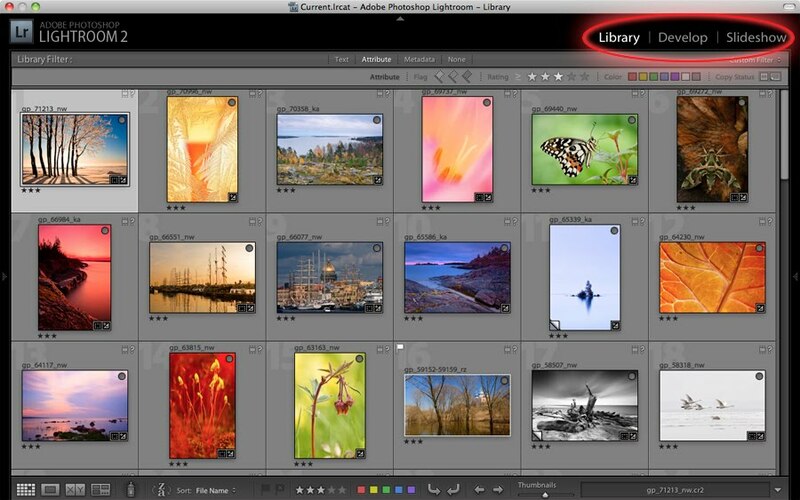 Have you ever thought about speeding up your Adobe Photoshop Lightroom experience? Well, it is the great application for pro photography workflow, but sometimes it's not yet as quick as you would like to. So how can you optimize it? To install an SSD into your system is a great option, but pricey. We'll speed up the app for free. Hence I offer another method. 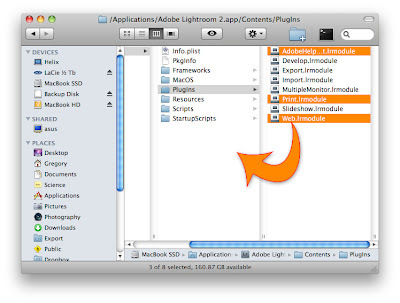 Idea is simple: turn off some of abundant Lightroom modules, or plug-ins, and application will start and work faster. 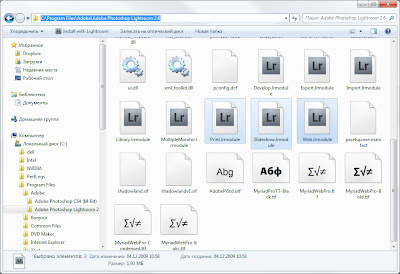 AdobeHelpClient.lrmodule - help and support for Lightroom. Rarely needed. This file is present only in Mac OS X version. Develop.lrmodule - one of the main modules. You should not disable it. Import.lrmodule - this is used to enrich your catalog with new photos. Do not disable. MultipleMonitor.lrmodule - this module is responsive to Multiple Monitor mode. If you are not that happy one who work on dual monitor system, feel free to disable. Print.lrmodule - printing support. As for me, I almost never print photographs with my computer, only in Pro Lab. Slideshow.lrmodule - this is used to make slideshows. If you aren't running slides time to time, disable this. * Note this module is somehow important for multiple monitor configuration. Web.lrmodule - this is used to generate web galleries. You may disable this if your workflow consists of only sorting and developing photos. Windows version also includes Gallery.lrmodule. That's not lots of fun to disable it. I'm disabling AdobeHelpClient, Print and Slideshow. 1. Quit Lightroom in case you are using it. 4. You're done! 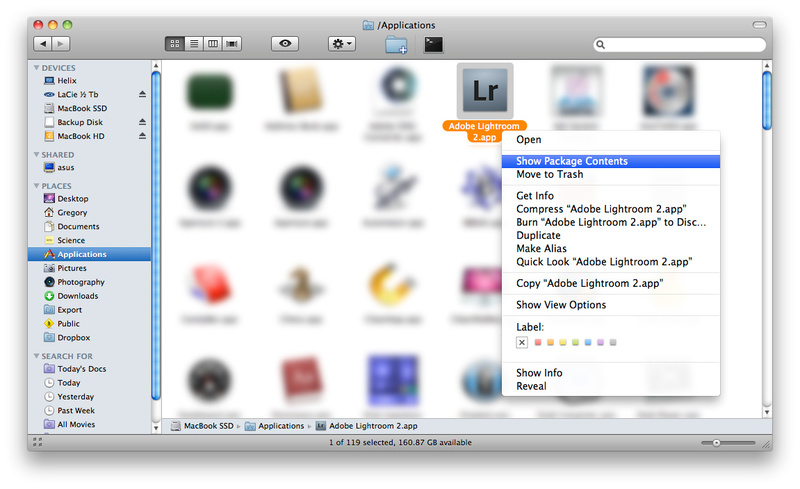 Launch Lightroom, notice the speed increase and see what's changed. 2. 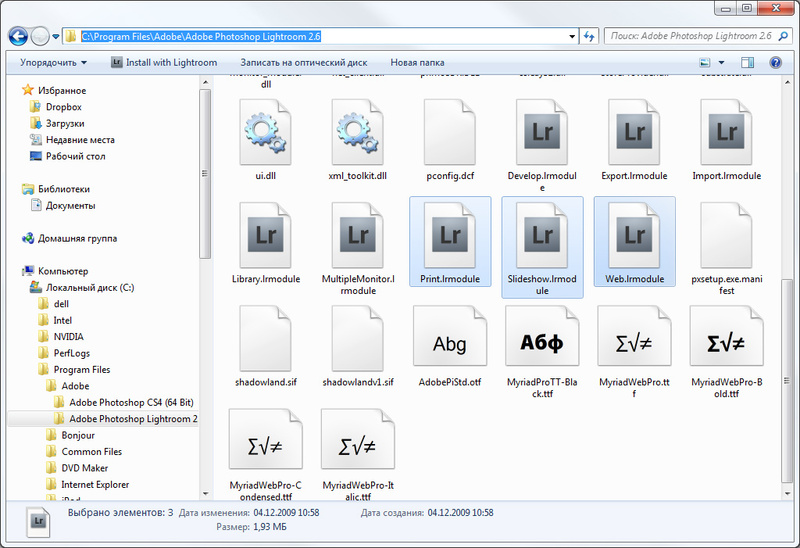 Open Explorer, navigate to C:Program FilesAdobeAdobe Photoshop Lightroom 2.6. 4. Cut them (Ctrl-X) and paste, say, to parent folder. 5. You're done! Launch Lightroom, notice the speed increase and see what's changed. 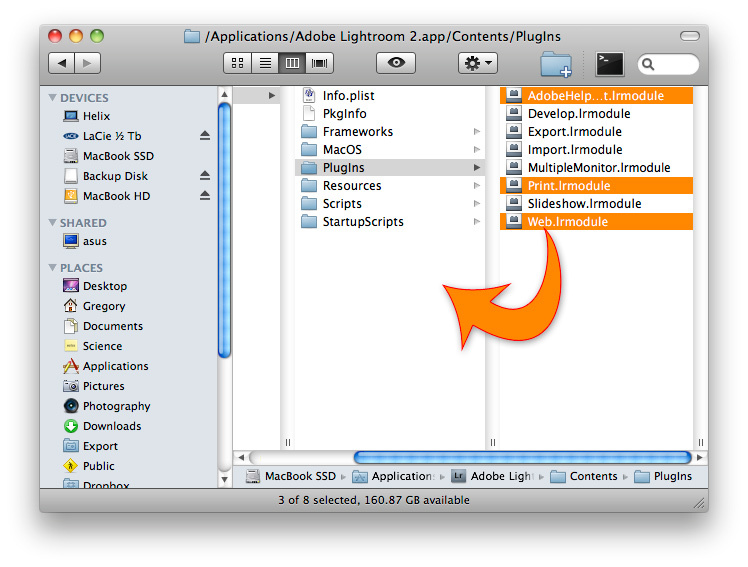 You have now less modules in top-right of the Lightroom application. It also runs faster due to less memory usage.